As the GRACE-twins fly in formation over the Earth the precise speed of each satellite and the distance between them is constantly communicated via a microwave K-band ranging instrument. As the gravitational field changes beneath the satellites - correlating to changes in mass (topography) of the surface beneath - the orbital motion of each satellite is changed. This change in orbital motion causes the distance between the satellites to expand or contract and can be measured using the K-band instrument. From this, the fluctuations in the Earth's gravitational field can be determined. Here's an example of how it works. The two GRACE satellites are traveling in space, both 500 kilometers above the earth. As the front satellite approaches an area of higher gravity, it will be pulled toward the area of higher gravity and speed up. This increases the distance betweenthe two satellites. As the satellites straddle the area of higher gravity, the front satellite will slow down and the trailing satellite will speed up. As the trailing satellite passes the area of higher gravity, it will slow down and the lead satellite will not be affected. As the satellites move around the Earth, the speeding up and slowing down of the satellites will allow scientists to measure the distance between the two satellites, and, therefore, map the earth's gravity field. A map of the Earth's gravitational field can in turn be used to infer mass changes driven by (for example) melting glaciers, changes in groundwater, or a variety of other phenomena, making GRACE useful for a wide variety of different research topics. JPL's main site for the project is here, and a (long) list of publications using GRACE data is available here. 3) "Mom, where do atmospheric data come from?" The range of projections for a single emission scenario in 2100 (in the IPCC graph below, one of the grey bars on the right) is probably about 2.5 degrees Celsius. But the range of average projections across the various emissions scenarios (compare the colored mean-stripe across the grey bars) is about 2 degrees Celsius. The climate modelers are "responsible" for reducing the uncertainty of a projection for a given emissions scenario, but the policy-makers are "responsible" for determining which emissions scenario we're on. Thus, about half of our uncertainty regarding climate-induced changes by 2100 is due to our inability to choose a policy trajectory. Figure SPM.5. Solid lines are multi-model global averages of surface warming (relative to 1980–1999) for the scenarios A2, A1B and B1, shown as continuations of the 20th century simulations. Shading denotes the ±1 standard deviation range of individual model annual averages. The orange line is for the experiment where concentrations were held constant at year 2000 values. The grey bars at right indicate the best estimate (solid line within each bar) and the likely range assessed for the six SRES marker scenarios. The assessment of the best estimate and likely ranges in the grey bars includes the AOGCMs in the left part of the figure, as well as results from a hierarchy of independent models and observational constraints. 8) "We can only have as good a foreign policy as the public's understanding of world affairs." conducted in 1976/7 and 1988 also contain extensive histories on employment, marriage, fertility and migration. Respondents in the first wave were followed in the subsequent waves; in the second wave, a refreshment sample was added. MFLS1 (1976/77) and MFLS2 (1988) are in the public domain. The China Health and Nutrition Survey was conducted in 1989 and 1991 in 8 provinces in China and provides a wealth of detailed information on health and nutrition of adults and children including physical examinations. These data are available at UNC. See the Measure DHS website for a list of countries that have been surveyed. Yes, that last one is a personal favorite. The Journal of Peace Research recently published an entire special issue dedicated to climate and conflict which contains papers from a 2010 conference. Nils Petter Gleditsch is the editor of the issue, and in his introduction he suggests that he's not worried about future climate change (WRT conflict) based on findings presented in the issue. We had a brief exchange about his interpretation on the Monkey Cage where he suggests that climate may influence conflict (recognizing our 2011 findings), but he is skeptical that anthropogenic climate change will matter. I suppose this is fair enough, since nobody can say anything about the future with certainty. But his conclusions are based on empirical studies which are also necessarily historical, so it seems a little contradictory to think that they are somehow more informative about the future than other empirical historical studies. This point aside, I've taken Nils' advice and started reading the papers in the issue. 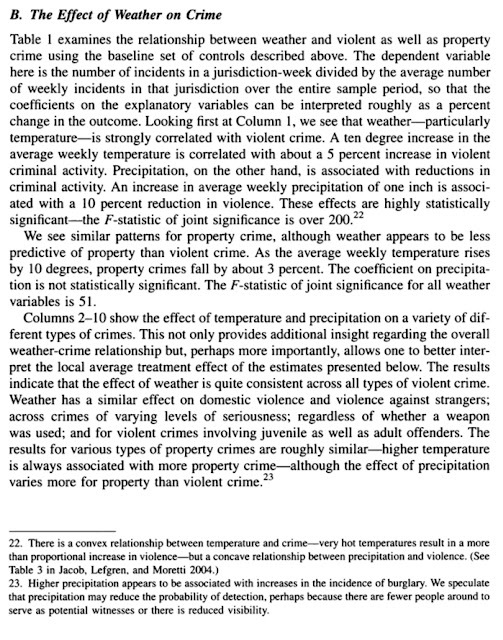 My first reaction was a second wave of surprise at his conclusions, since most of the empirical papers in the issue seem to actually find a link between climatological parameters and conflict, although I haven't carefully kept score yet. When I finish reading the issue, I will post my conclusions on this. Abstract: Much of the debate over the security implications of climate change revolves around whether changing weather patterns will lead to future conflict. 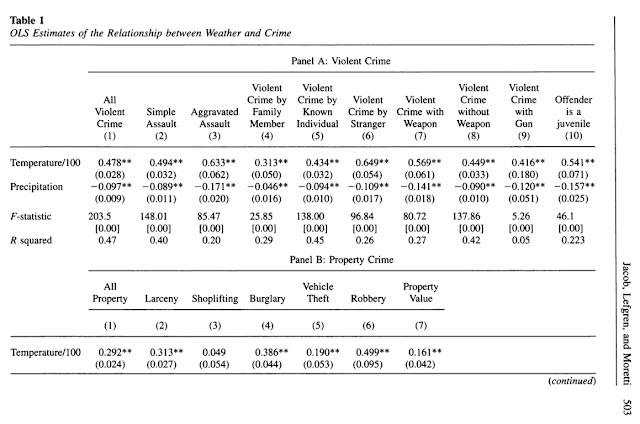 This article addresses whether deviations from normal rainfall patterns affect the propensity for individuals and groups to engage in disruptive activities such as demonstrations, riots, strikes, communal conflict, and anti-government violence. In contrast to much of the environmental security literature, it uses a much broader definition of conflict that includes, but is not limited to, organized rebellion. 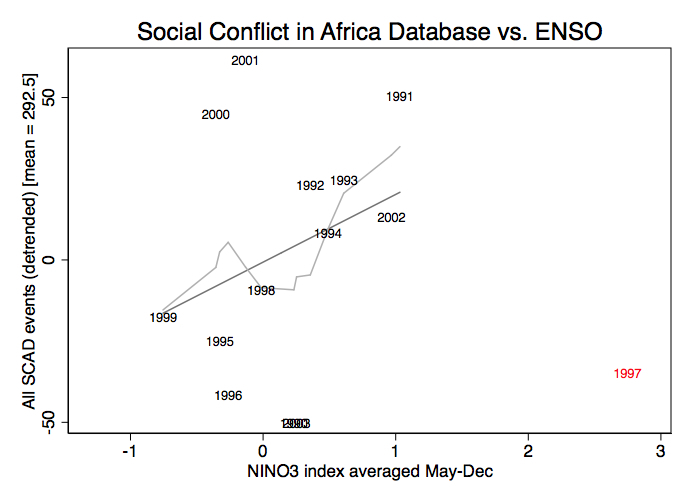 Using a new database of over 6,000 instances of social conflict over 20 years – the Social Conflict in Africa Database (SCAD) – it examines the effect of deviations from normal rainfall patterns on various types of conflict. 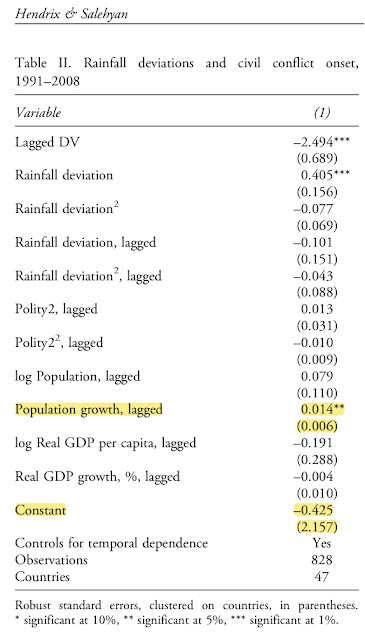 The results indicate that rainfall variability has a significant effect on both large-scale and smaller-scale instances of political conflict. 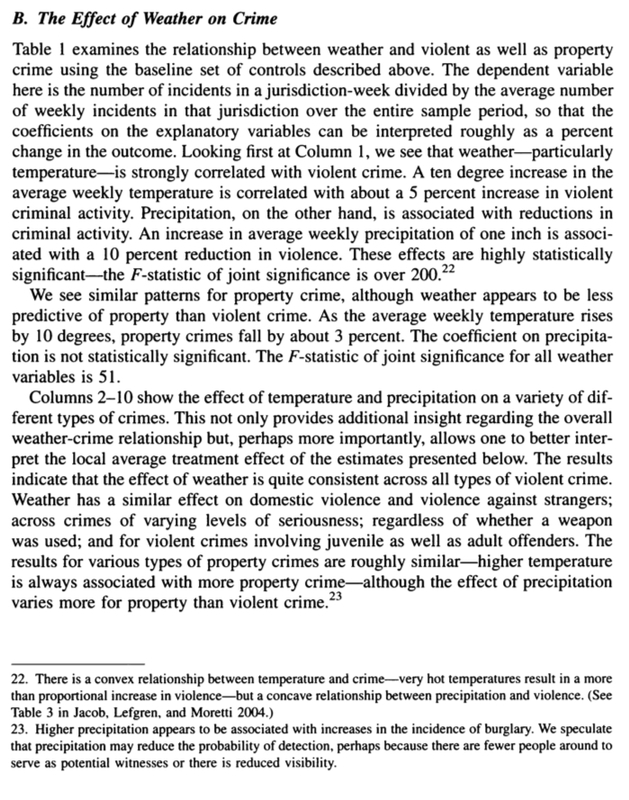 Rainfall correlates with civil war and insurgency, although wetter years are more likely to suffer from violent events. 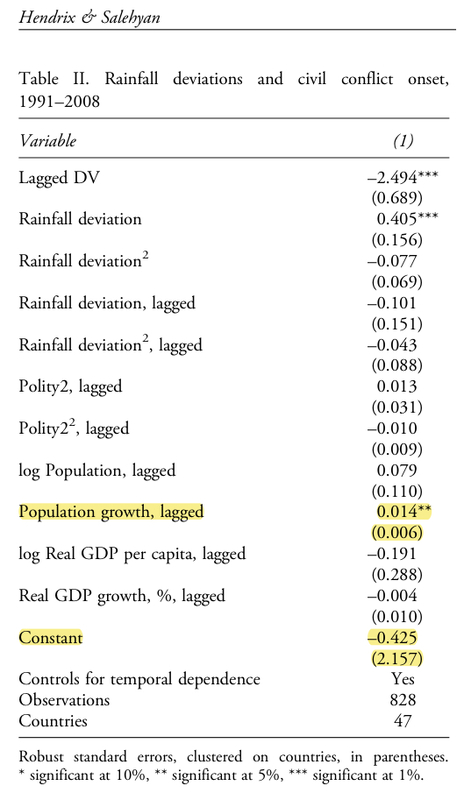 Extreme deviations in rainfall – particularly dry and wet years – are associated positively with all types of political conflict, though the relationship is strongest with respect to violent events, which are more responsive to abundant than scarce rainfall. By looking at a broader spectrum of social conflict, rather than limiting the analysis to civil war, we demonstrate a robust relationship between environmental shocks and unrest. The highlighted coeffs don't match, but they are just "controls" so we may not care much about them being mistabulated. 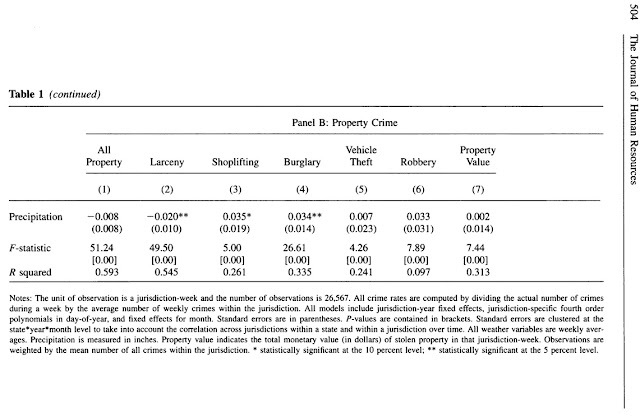 The underlined variables aren't reported in the first model (although I think they must have been included in model the authors ran because when I dropped them, the rest of the coeffs went haywire). I mention this not to be a nag, but to explain why my estimates below don't match those in the paper exactly. Two things happen when I try to reconcile HS with HMC. 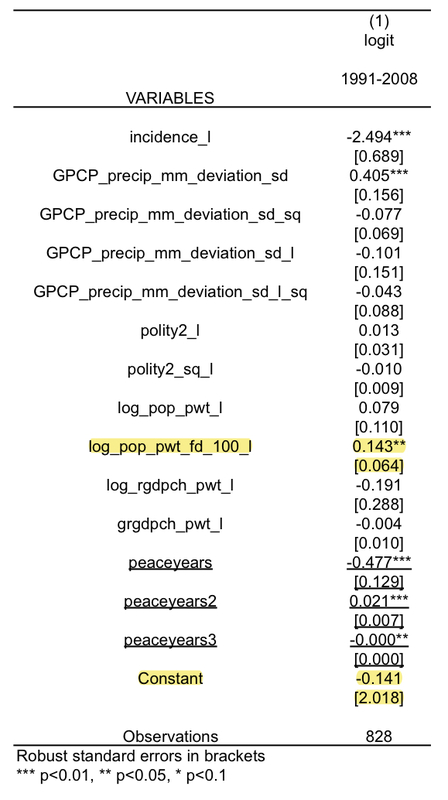 First, dropping 2005-2008 causes their strong positive correlation between conflict-onset and normalized-standardized-rainfall (GPCP_precip_mm_deviation_sd in the table) to drop by half in magnitude. Because the standard errors don't change much, this also makes the coeff much less significant. However, the coeffs are not actually significantly different from one another, so this change is hard to interpret conclusively. Although it is worth noting that almost none of the other coeffs (except current normalized-standardized-rainfall) move very much. 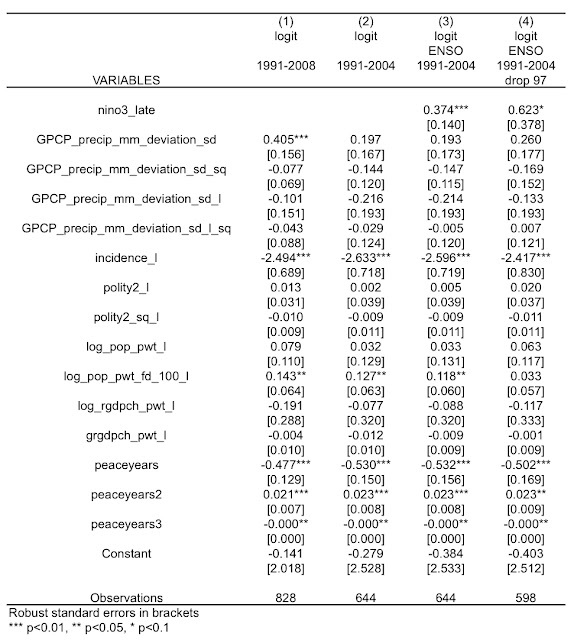 Second, when I introduce our measure or ENSO (nino3_late in the table), it comes out with a strong positive correlation, consistent with earlier results of HMC. The coeff on normalized-standardized-rainfall doesn't change much, suggesting these correlations are reasonable orthogonal. When I drop 1997, the coeff on ENSO doubles in size, but so does the uncertainty. 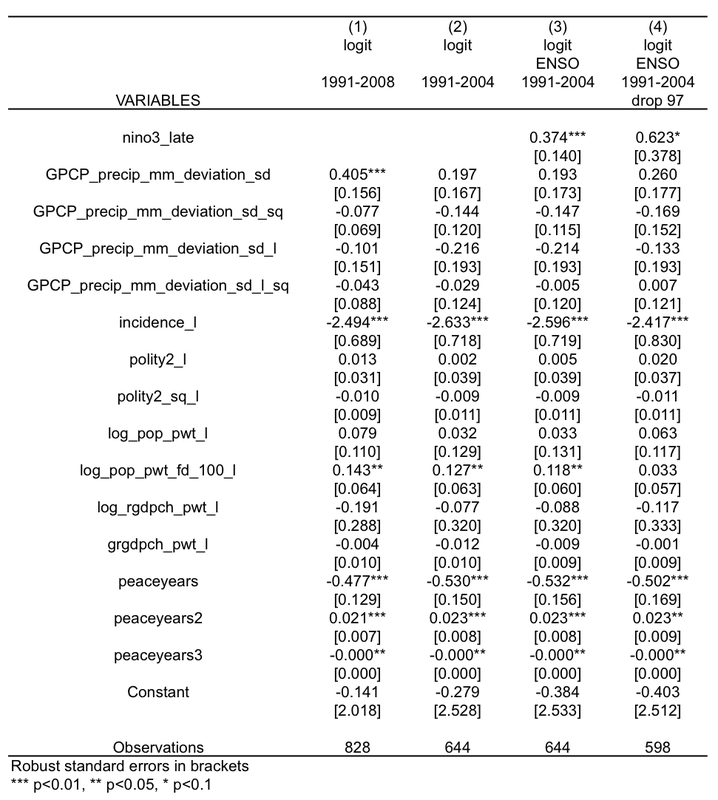 Overall, I think this tells us that HS doesn't overturn the findings of HMC, suggesting that the effect they may be measuring is not related to ENSO. Although it also suggests that the positive correlation HS observe (between local rainfall and conflict onset) might be a little sensitive to the sample/specification (since notability, they also don't control for temperature which is definitely correlated with rainfall). 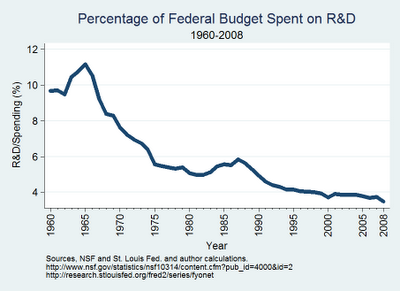 Since the panel is so short, 1997 is a monstrous outlier. 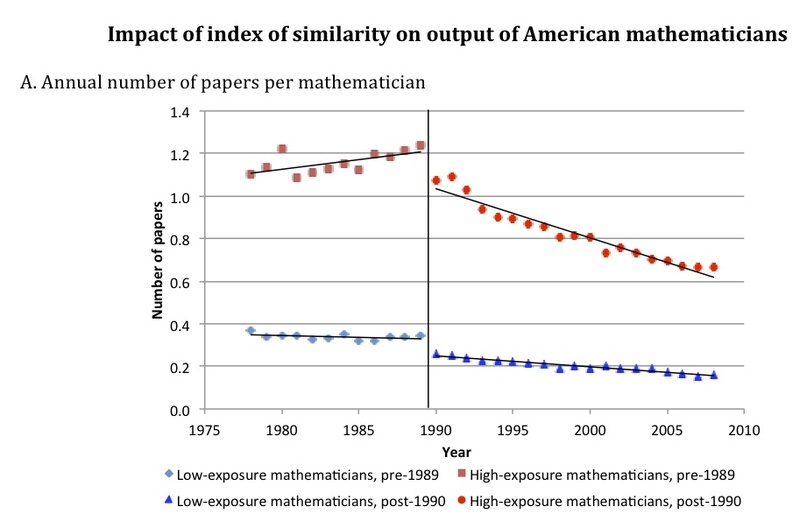 But if we ignore it (as the critics who don't like the results of HMC keep arguing for) we see a pretty large positive correlation (although, unsurprisingly it's not quite significant with N = 13). 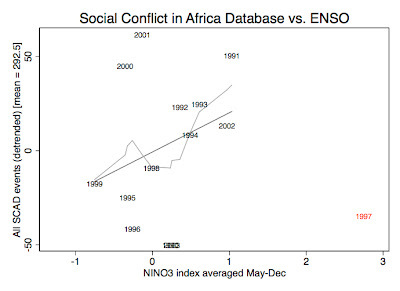 I think this is pretty interesting, since the SCAD database contains less-organized, less-deadly or less-political conflict than the PRIO data analyzed in HMC and it still exhibits a positive correlation with ENSO, similar to organized, deadly, political violence presented in HMC. Climate change poses threats to human health, safety, and survival via weather extremes and climatic impacts on food yields, fresh water, infectious diseases, conflict, and displacement. Paradoxically, these risks to health are neither widely nor fully recognized. Historical experiences of diverse societies experiencing climatic changes, spanning multicentury to single-year duration, provide insights into population health vulnerability—even though most climatic changes were considerably less than those anticipated this century and beyond. Historical experience indicates the following. (i) Long-term climate changes have often destabilized civilizations, typically via food shortages, consequent hunger, disease, and unrest. (ii) Medium-term climatic adversity has frequently caused similar health, social, and sometimes political consequences. (iii) Infectious disease epidemics have often occurred in association with briefer episodes of temperature shifts, food shortages, impoverishment, and social disruption. 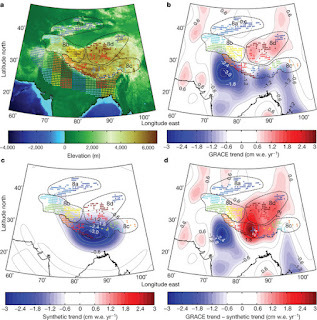 (iv) Societies have often learnt to cope (despite hardship for some groups) with recurring shorter-term (decadal to multiyear) regional climatic cycles (e.g., El Niño Southern Oscillation)—except when extreme phases occur. (v) The drought–famine–starvation nexus has been the main, recurring, serious threat to health. 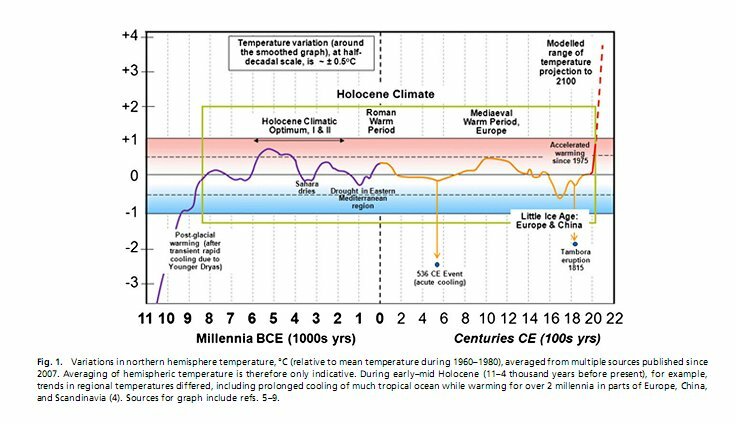 Warming this century is not only likely to greatly exceed the Holocene's natural multidecadal temperature fluctuations but to occur faster. Along with greater climatic variability, models project an increased geographic range and severity of droughts. Modern societies, although larger, better resourced, and more interconnected than past societies, are less flexible, more infrastructure-dependent, densely populated, and hence are vulnerable. Adverse historical climate-related health experiences underscore the case for abating human-induced climate change. Not to be that guy, but there's a huge number of potential paper ideas lurking in this one. Not the usual fare, but I'm related to too many mathematicians (and lost too many high school math competitions to children of Russian immigrants) to pass this one up. Abstract: It has been difficult to open up the black box of knowledge production. 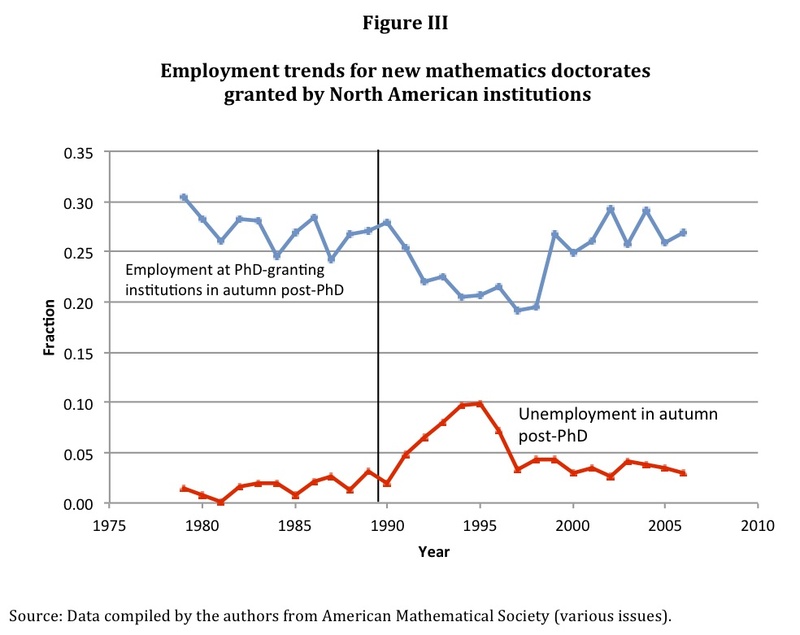 We use unique international data on the publications, citations, and affiliations of mathematicians to examine the impact of a large post-1992 influx of Soviet mathematicians on the productivity of their American counterparts. 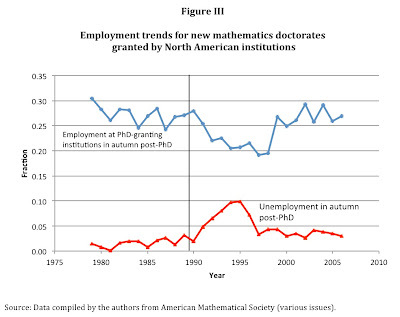 We find a negative productivity effect on those mathematicians whose research overlapped with that of the Soviets. We also document an increased mobility rate (to lower-quality institutions and out of active publishing) and a reduced likelihood of producing “home run” papers. 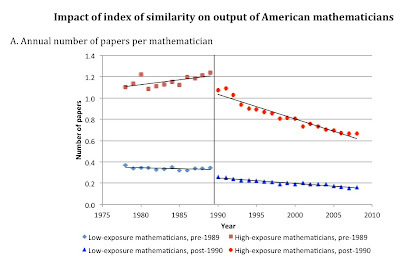 Although the total product of the pre-existing American mathematicians shrank, the Soviet contribution to American mathematics filled in the gap. However, there is no evidence that the Soviets greatly increased the size of the “mathematics pie.” Finally, we find that there are significant international differences in the productivity effects of the collapse of the Soviet Union, and that these international differences can be explained by both differences in the size of the émigré flow into the various countries and in how connected each country is to the global market for mathematical publications. 1) IFTT: automated boolean task management in the cloud (via @kristilewton). I feel like this could do for general internet use what Dropbox did for file storage. Abstract: The prospects for a revival of nuclear power were dim even before the partial reactor meltdowns at the Fukushima nuclear plant. Nuclear power has long been controversial because of concerns about nuclear accidents, proliferation risk, and the storage of spent fuel. These concerns are real and important. 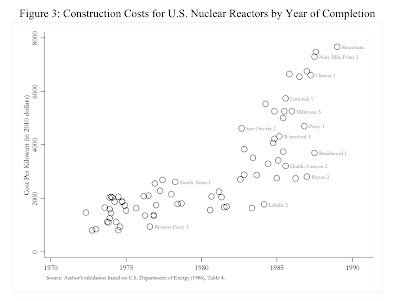 In addition, however, a key challenge for nuclear power has been the high cost of construction for nuclear plants. 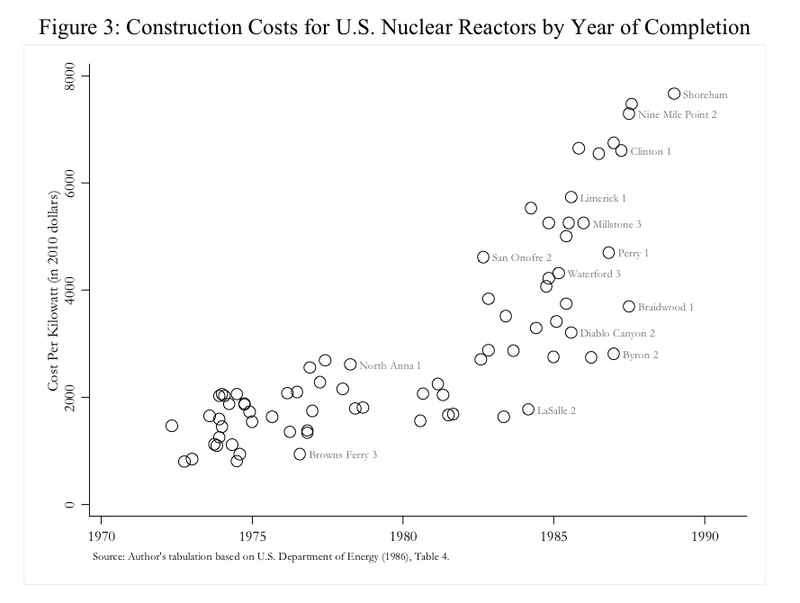 Construction costs are high enough that it becomes difficult to make an economic argument for nuclear, even before incorporating these external costs. This is particularly true in countries like the United States where recent technological advances have dramatically increased the availability of natural gas. You can watch video lectures followed by quizzes to challenge and hopefully stimulate your understanding, and work your way through tutorials with interactive models and simple mathematical ideas. Actually all that stuff has been available for a long time, online or in the textbook, but now it’s packaged into an interactive assessing system, which admittedly lacks the personality and finesse of our graduate student teaching assistants, but I hope it’ll get the job done. You can work at your own pace, on your own time. You don’t get University of Chicago credit, but it’s free, and if you get to the end of it you can download a certificate of accomplishment with your name and a verification code, signed by me. I hope people find it useful. I've poked around in it and it looks pretty great. If you read this blog and find yourself wishing you knew more basic climate, this might be the way to bone up.